Sirius is Simply The World's Most Powerful And Easiest To Use Astrology Software! Extraordinarily Flexible and Customizable. Quickly Access The Charts And Reports You Need, And Also Have A	Wealth of Additional Tools Available. 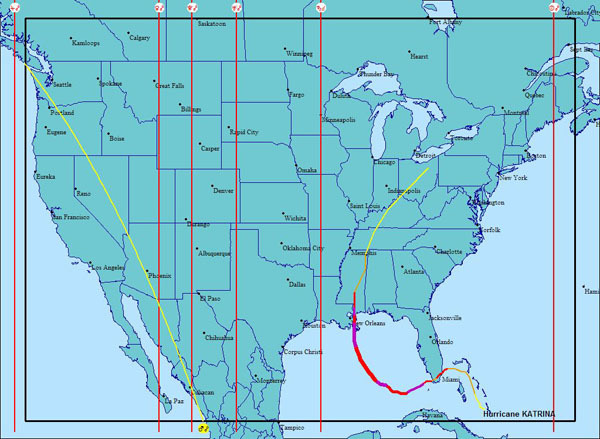 Track Hurricane Path: This feature allows you to view hurricane paths on an AstroMap. It provides the ability to view a hurricane path on an AstroMap. Astrologers interested in AstroMeteorology this feature is very helpful. You can also download additional hurricane data and import it so that these hurricane paths can also be viewed. Fortunately, you can download hurricane data from websites. Websites can change their content but as of early 2008 the website http://weather.unisys.com	and the website page on this site at http://weather.unisys.com/hurricane/index.html provide hurricane data that you can download. After downloading the data you can enter the file name in the field provided for this in Sirius. Sirius has a "Browse" button that provides a convenient way to select the file and have the file name placed in this field. You can then click the "Add File name Shown Below" button to add it to the list of hurricane path files. Once the file is saved and converted to Sirius file format, the data is saved in file permanently.